At PRISTINE LANDSCAPING, we're dedicated to mastering the art of landscaping. You supply the vision for your space, and we'll do the rest. We know exactly what it takes to both create and maintain the exact look and feel you have in mind for your backyard, courtyard, golf course, commercial property, or anyplace else you have in mind for beautiful, lush landscaping. Ground Zero Landscape and Construction LLC. We design and install all types of custom landscapes, desert landscapes, xeriscapes, drought tolerant landscapes, urban landscapes, formal landscapes, outdoor living areas, waterscapes, ramadas, pergolas, artificial turf, curbing, concrete, masonry, pavers, flagstone, travertine, outdoor kitchens and tropical paradises. Consider installing synthetic turf and putting greens to help conserve our water and save you money in the long run. We specialize in the design and installation of Belgard Paver and natural flagstone patios, pool decks, acrylic concrete overlays, driveways, and walks. Have you dreamed about having the ultimate outdoor kitchen? Let us design your custom BBQ, fire pit, entertainment center, and built in bar. Other services include artificial turf, landscape lighting and excavation & hauling. Now that you have your dream backyard or front yard you will need to keep it maintained. Our maintenance department is staffed with trained specialists that will keep your dream looking its best. We accept all major credit cards and have financing available upon approval. Call us today for a free 3D design consultation. We specialize in landscape renovation and new construction projects. Our designs include all the elements to create your very own outdoor, "Dream Retreat." From paver patios & pool decks, to outdoor kitchens, fireplaces, fire pits, putting greens and ramadas, we have the expertise to create a complete outdoor living space. We offer free consultations and will come to your home to discuss your ideas, desires, budget and individual characteristics of your landscape project. From the initial layout to the finishing touches, our team provides you with the highest level of customer service and workmanship to ensure your new landscape will give you many years of enjoyment. Check out some of the landscape projects that we have done. Merit Landworks is a firm specializing in creating exterior environments. Our highest level of detail in both the design and construction process makes us a leader in landscape design and implementation. Merit Landworks prides itself on the evolution of our client’s goals from the initial design phases to the construction phases ultimately achieving their vision. Our working experience with our clients makes for a lasting relationship over the lifetime of their exterior environment. As designers, we take pride in understanding our client’s goals and ultimately creating the vision for them. It is important for us to establish lasting relationships with our clients and the evolution of the properties that we are involved. Services include: SITE ANALYSIS SITE PLANNING COMMUNITY COVENANTS AND RESTRICTIONS RELATED TO EXTERIOR DESIGN OF COMMUNITY HOMES DESIGN GUIDELINES COLOR RENDERINGS AND SKETCHES CAD CONSTRUCTION DOCUMENTATION NATIVE PLANT SALVAGE ASSESSMENTS PLANTING DESIGN OUTDOOR LIVING DESIGN COURTYARD DESIGN GARDEN DESIGN POOL AND SPA DESIGN WATER FEATURE DESIGN LIGHTING DESIGN IRRIGATION DESIGN FURNITURE CONSULTATION COMMUNITY ENTRY FEATURES CONSTRUCTION BUDGETING CONSTRUCTION BIDDING CONSTRUCTION ADMINISTRATION PROJECT MANAGEMENT Merit Landworks specializes in design/build in effort to keep close watch on your project from start to finish. Choosing a design/build firm is essential in creating your environment on a timely manner and within a desired budget. Working with design/builds ensures that your designs are executed through our expertise in contracting from inception to completion. Design/Build Elements: TREE SALVAGE AND REPLANTING CACTUS SALVAGING LANDSCAPE PLANTING BOULDER INSTALLATION COURTYARDS AND GARDENS RAMADA AND SHADE STRUCTURES BARBEQUES AND OUTDOOR KITCHENS DECORATIVE LANDSCAPE POT WATER FEATURES WALLS EXTERIOR LIGHTING PAVERS IRRIGATION FIREPLACE AND FIREPITS SYNTHETIC TURF POOLS AND SPAS Whether it is creating curb appeal or delivering a private resort, Merit Landworks assists in the many facets of the design/build process. We work with a variety of high quality builders and architects to enhance properties to improve the entire exterior of the property. Why look any further? We are your premier choice for a professional lighting design / layout and product sourcing. Sonoran Lighting Supply serves the wholesale, retail and specification markets. We specialize in outdoor lighting design, sourcing and education. We are the one stop shop for your lighting needs. RETAIL SERVICES: We offer a design service to the end user that will ensure the best possible results as well as take your project to bid with several highly qualified licensed contractors. We manage the installation process from start to finish so that you dont have to. Why not preserve the most important thing (design) and save money on your overall project? Call us today to schedule your consultation. WHOLESALE SERVICES: Sonoran Lighting Supply support's most major name brands and can source anything odd you might be in need of. We also provide design services and training to your business to help add to your bottom line. LANDSCAPE ARCHITECTURE SERVICES: We offer project management servies to landscape architects to review the lighting design, lighting key’s, application and even monitor the project through installation to ensure that the specified product and design are put into place. Do you need a estimate of probable cost, lighting take off, spec sheets etc...? Call us today and lets get started on a highly productive long lasting relationship. Originating in New Jersey, three brothers, Andrew, Eddie, and Ryan Meise have spent their lives in the landscaping industry. With over 25 years of experience, they have developed a vast amount of knowledge and experience in the field of landscape design, installation, and maintenance. After working for the family’s landscaping company in the Garden State since the age of 16, Andrew migrated to the desert to receive his degree in Landscape Architecture from Arizona State University. His brothers Eddie and Ryan were soon to follow. Now with over a decade of experience in the desert, the three have developed a deep respect for the desert environment, and succeeded in creating unique, detailed spaces for a wide variety of clients. With skills ranging from consultation, to design development, implementation, and maintenance, MDG works closely with clients to develop relationships and deliver an exceptional product. Plant selection & placement, irrigation systems, site analysis, accent-lighting, paving, hardscapes, and master planning are a few samples of what Meise Design Group can offer. Pro Outdoor Services was founded with a simple yet powerful mindset; Provide our customers with high quality work, honest pricing and incredible service. We believe taking care of our customers is the number one priority whether their project is small or large. Our company works very hard to ensure our customers are not only satisfied with our work, but so happy with our work they refer friends and family and always call us back when they need our further help. We don’t sell our clients things they don’t need, and we don’t cut corners on our projects. We strive to maintain our reputation as a landscape design and construction company that does the job right, and takes extremely great care of our customers. Pro Outdoor Services was established to provide high-quality custom landscaping solutions with complete landscape construction and installation. Whether you are looking for front yard landscape landscape lighting, a back yard misting system, or landscape remodeling, you can trust the experts at Pro Outdoor Services to help you create your own unique outdoor oasis. 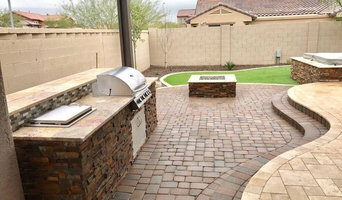 As a complete landscape installation contractor in Central and Northeast Phoenix, Scottsdale, Paradise Valley, Cave Creek, Carefree, Fountain Hills, Mesa, Chandler, Gilbert, Tempe, Ahwatukee, North Peoria, and North Glendale, we manage your landscaping project from concept to completion which allows you to work with one vendor creating a close working relationship with the focus of high-quality workmanship and complete satisfaction. Our goal is to work with you to create your personalized outdoor oasis so that you can enjoy the beautiful outdoor weather that Arizona has to offer year round. Our Christmas light installers have years of experience performing professional quality installations on all types of homes and businesses. We can do any job, from simple lights to fully functional music displays. 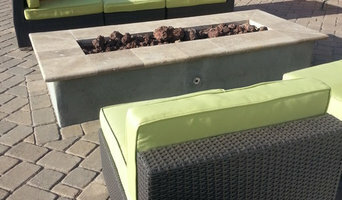 Arizona Living Landscape & Design is landscaping Arizona. If you are looking for the best full service landscaper in the Phoenix Arizona east valley, Arizona Living Landscape is the company to call for quality service, creative designs, and amazing customer service all at an affordable price. Az Living Landscape can custom design the creative pool and yard landscape of your dreams. We have affordable landscape packages for any budget or we can custom landscape design anything you can imagine for your creative outdoor environment. Designing, installing, and maintaining your Arizona landscape is so much easier with professional services provided by Arizona Living Landscape and Designs. Divine Creations Landscape and Lighting offers professional landscape design and installation services for both our residential and commercial clients. John Bowen, owner and founder of Divine Creations, has had extensive experience in all facets of landscape and hardscape design, installation, and maintenance spanning over 25 years. Divine Creations helps clients turn their outdoor vision into reality. Projects of any size can be designed and completed with the client specifications, budget and vision in mind. Divine Creations also offers full monthly maintenance for projects we install or for existing landscaping. Please visit the Landscape section for more information. A home is not just a house. A home is a sanctuary, an abode, a reflection of your inner being and deepest values. As such, the outdoor portion of your property can be just as much a home to you as the interior of your dwelling. Contact us today to set up a free consultation. Big Daddy Construction & Design is Passionately Dedicated to Your Vision…Committed to Excellence In All That We Do…Will Thoughtfully & Thoroughly Manage the Construction Process…Responsibly Delivering On Time & Within Budget. We are a full service construction company with seasoned leadership and over 20 years of contracting experience in the Phoenix area. Our focus is on Swimming Pool and Backyard Design/Build and we have the experience to deliver all your construction needs. At "Big Daddy" we believe that the journey is as important as the destination, and good communication is key to every successful project. You will work with one of our talented Project Manager/Designers, and they will be at your service from the first meeting to the time your project is complete. Our scheduling is done online where you can login and monitor up to the moment details and see when the next phase of construction will begin. The "Fit & Finish" and the level of detail we deliver is the best in the industry. We achieve this by installing the highest quality equipment and components available, the construction detail we employ on every project and by working with best craftsmen in our market. When it is complete you will be proud of your "Big Daddy" project. Please contact us for your next construction project, you'll be glad you did. "Welcome to the Family." Sustain Scape is a full service landscaping company offering designs, installation and maintenance with an emphasis on sustainability. The owner, Mike Robison, is degreed in landscape architecture, has 10 years experience in landscaping and is a licensed contractor. His designs include projects internationally from residential courtyards to masterplans for parks and large housing developments. As a past employee of various landscape firms, he has noticed that landscape designs can change dramatically as they pass through the many hands that can be involved in the entire process. Therefore, he saw a need for a company that does it all. Unlike many others, your designer overseas all phases of your job from the initial meeting to the installation and the maintenance ensuring the entire process runs smoothly. We are a full-service, creatively driven, outdoor design agency. Simply put, ONE is here to help your yard look and function better. ONE is dedicated to doing the very best work for our customers, which is defined by delivering the best return on investment possible - while living the dream. ONE is extraordinarily bullish about its future and works tirelessly to push the boundaries on what's possible to drive unparalleled value for our customers. Through creativity, innovation, and performance, we deliver solutions that transform our customer's yards and protect their investment. Creativity has the power to transform human behavior. We can create an atmosphere where you can sit back and relax, or make your yard the best place to party.